The different classes of G proteins are defined by their sequence identity as well as their downstream effector coupling specificity. There are over 20 Ga-subunits known to date, and they are divided into four major Ga subfamilies. Because the coupling of the receptor to the different classes of G proteins specifies the signaling pathways that are activated, GPCRs are functionally classified according to their coupling specificity, such as Gs- or Gq-coupled receptors. Several recent reviews have detailed the expression and biological significance of G protein pathways (12-14). The Gas family includes Gas, GasXL, and Gaolf. Members of this family of Ga-subunits interact with and stimulate the activity of adenylyl cyclase to increase cAMP levels. Additionally, the Ga-subunits are sensitive to the cholera toxin made by Vibrio cholera. The A1 subunit of cholera toxin is an intracellular adenosine diphosphate (ADP)-ribosyl transferase that catalyzes the covalent addition of the ADP-ribose moiety from NAD+ to Gas. ADP-ribosylated GasGTP can activate adenylyl cyclase but cannot hydrolyze the GTP to GDP; therefore, Gas remains constitutively active. There are four splice variants of Gas, and they are all known to stimulate adenylyl cyclase activity (15). The "extra large" G protein ( GasXL), which is expressed in neuroendocrine cells, is a plasma membrane-associated protein; it consists of a novel 37-kDa XL domain followed by a 41-kDA as-domain encoded by exons 2 to 13 of the Gas gene (16,17). Similarly to Gas, GasXL can bind GTP and stimulate adenylyl cyclase activity, but it remains to be determined whether GasXL can interact with GPCRs that are known to interact with Gas in vivo (17,18). The final member, Gaolf, which was initially discovered in the neuroepthilium and striatum and considered to be the G protein of the olfactory system, shows 88% homology to Gas. It has been shown to stimulate adenylyl cyclase, can be constitutively activated by cholera toxin, and can interact with the P-AR (19,20). Gaolf is involved in odor-evoked signal transduction because Gaolf knockout mice are anosmic (21). It is believed that upon odorant binding, the odorant receptor activates Gaolf, which consequently activates adenylyl cyclase III (AC3). AC3 then raises cAMP levels, causing cyclic nucleotide-gated channels to open, which leads to an influx of cations and, eventually, the formation of an action potential that signals to the brain (22). Gaolf has also been shown to be present in peripheral tissues; more recently, it has been implicated in oncogenic transformation of digestive and urogenital epithelial cells (23). 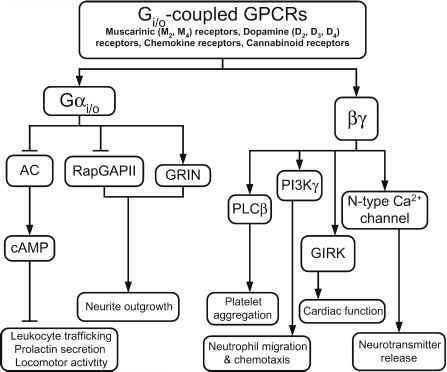 There are three major pathways by which Gs-coupled receptors take effect. All of these involve adenylyl cyclases and cAMP. Most of the effects of cAMP occur through the activation of protein kinase A (PKA), which can phosphorylate and regulate diverse substrates such as transcription factors, metabolic enzymes, and channels. In recent years, it has been demonstrated that cAMP can bind directly and regulate the activity of Epac (the exchange factor for the small GTPase Rap), thereby stimulating Rap activity. In sensory organs such as the nasal neuroepithelium, cAMP also binds and regulates the activity of cyclic nucleotide-gated channels. The various effector pathways for Gas are summarized in Fig. 1. Fig. 1. The Gas signaling pathway. This schematic diagram demonstrates how the Gas-AC pathway regulates multiple physiological processes, including olfaction, homeostatic regulatory functions, proliferation, and differentiation. AC, adenylyl cyclase; PKA, protein kinase A; CNGC, cyclic nucleotide-gated channel; GEF, guanine exchange factor; Rapl, a small GTPase; MAPK, mitogen-activated protein kinase; B-Raf, MAP Kinase Kinase Kinase for MAP Kinase Kinase 1,2. The Gai/o family includes Gaa, Gai2, Gai3, Gao, Gaz, Gagust, Ga^, and Gat-c. This family, with the exception of Gaz, is pertussis toxin-sensitive. This toxin, which is also an ADP-ribosyl-transferase, catalyzes the addition of ADP-ribose to the a-subunit of Gaj. This irreversible modification occurs on a cysteine, which is at the fourth position from the C-terminus. This region is also involved in coupling to receptors; hence, ADP-ribosylated Gai/o-subunits do not interact with receptors. Consequently, pertussis toxin inhibits receptor activation of the Ga i/o pathway. Gaa, Gai2, and Gai3 are products of different Gnai (name for genes encoding Gai members) genes, but all mediate inhibition of various adenylyl cyclases (24,25). They are partly functionally redundant because Gair and Gai3-deficient mice do not shown gross phenotypic changes (13). However, Gai2-deficient mice show defects in B- and T-cell signaling (26,27). The most abundant G protein in the mammalian brain is Gao. Three isoforms of Gao exist; two of which are generated by alternative splicing, and the third is generated by posttranslational modification (28-30). This G protein is enriched in growth cones and has been implicated in neurite outgrowth (31,32). Recent studies using yeast two-hybrid screens and complementary DNA (cDNA) expression cloning have yielded some candidate proteins that are direct effectors of Gao. They include the GTPase-activat-ing protein (GAP) for the small G protein Rap (RapGAP), the GAP from Gaz (Gaz-GAP), RGS-17, and the G protein-regulated inducer of neurite outgrowth (GRIN) (33,34). An excellent review on Gaz signaling was recently published (35). Similarly to Gaj, Gaz can inhibit adenylyl cyclase and stimulate K+ channels (36,37). However, Gaz lacks a consensus site for ADP-ribosylation by pertussis toxin and is thus unaffected by it (38,39). Additionally, Gaz hydro-lyzes GTP at a much slower rate compared to other Ga-subunits, so it is not surprising that it interacts with several RGS proteins (35,40). Gaz can be phosphorylated by protein kinase C (PKC) and p21-activated kinase (PAK)1, leading to a decrease in Gaz's affinity for the GPy complex and thereby maintaining the G protein in an active state for a longer period of time (41,42). retransmitter release (44). A recent report by Zhang et al. (45) identified TRPM5 (a taste receptor cell-specific ion channel) and PLC-P2 as necessary for bitter, sweet, and umami signal transduction. The report demonstrated that TRPM5 and PLC-P2 knockout mice could not recognize bitter and sweet tastes as well as L-amino acids (45). Rod transducin (Gaj-r) and cone transducin (GOj-c) are the G proteins involved in visual transduction. The first type is important in dim illumination, and the latter is involved in color and sharp vision. In this system, a photon of light causes the isomerization of a visual pigment in rhodopsin, the GPCR involved in phototransduction. This conformation change stimulates the exchange of GTP for GDP in transducin. Transducin then activates cGMP PDE, also known as PDE8, by binding to the regulatory y-subunit of PDE8. PDE8 activation results in lower cytoplasmic cGMP levels, which leads to closure of cGMP-gated cation channels and membrane hyperpolar-ization. The hyperpolarization leads to a decrease in the release of the neu-rotransmitter glutamate at the photoreceptor terminal (46-48). 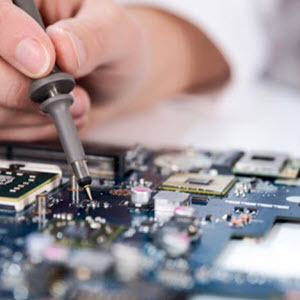 Therefore, a sensory stimulus is translated into an electrical signal that can be communicated to connecting neurons. The various pathways regulated by Gai/o are shown in Fig. 2. Because many of the biological effects of the Gai/o pathway are mediated through GPy-subunits, these pathways are also shown in Fig. 2. The Gaq/11 family includes Gaq, Ga11, Ga14, Ga15, and Ga16. This family of G proteins is coupled to the activation of PLC-P (49-51). Activation of PLC-p leads to the hydrolysis of phosphatidylinositol 4,5-bisphosphate (PIP2) and the production of inositol triphosphate (IP3) and diacylglycerol (DAG). Fig. 2. The Gai/o and Gbg signaling pathway. This schematic diagram demonstrates how the Gai/o pathway regulates multiple physiological processes such as leukocyte trafficking, locomotor activity, and neurite outgrowth. 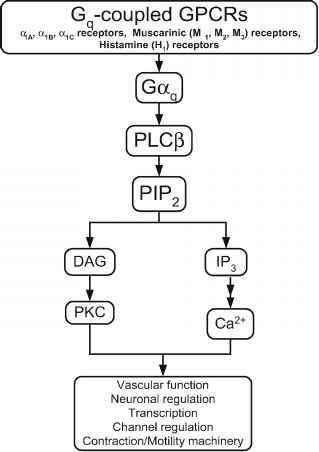 In contrast, GPy regulates other signaling pathways to affect physiological processes such as platelet aggregation, neutrophil chemotaxis, and neuro-transmitter release. AC, adenylyl cyclase, GAP, a GTPase-activating protein; GRIN, G protein regulator of neurite outgrowth; PLC-P, phospholipase-b; PI3Ky, phosphoinositide-3 kinase; GIRK, G protein-gated inwardly rectifying potassium channel. way leads to responses that are mediated through Ca2+ and PKC and is illustrated in Fig. 3. The Ga12 family includes Ga12 and Ga13 and defines the fourth class of G proteins. This family of G protein shares less than 45% sequence identity to other a-subunits and 67% homology to each other. Both proteins are ubiquitously expressed, although Ga13 is especially abundant in human platelets (55,56). Fig. 3. 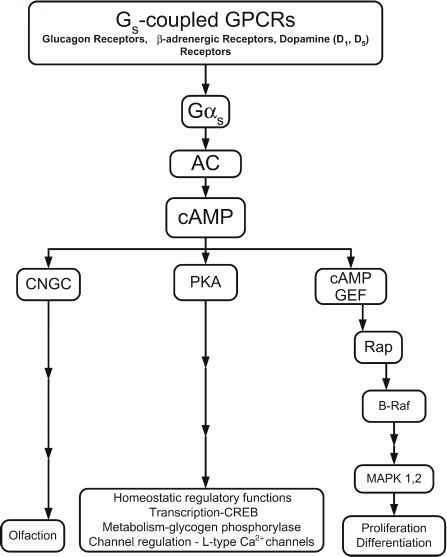 The Gaq signaling pathway. This schematic diagram demonstrates how the PLC-P pathway regulates multiple physiological processes including channel regulation, contraction, and neuronal regulation. PLC-P, phospholipase-P; PIP2, phosphatidylinositol 4,5-bisphosphate; DAG, diacylglycerol; PKC, protein kinase C; Ca2+, calcium ions. Several interacting proteins to either Ga12 or Ga13 have been identified by yeast two-hybrid screening, including HSP90, AKAP, nonreceptor tyrosine kinases, rasGAP, Rho guanine exchange factor (RhoGEF), radixin, protein phosphatase type 5 (pp5), and cadherin (57). The diversity of these interacting proteins suggests that the Ga12 family is involved in multiple signaling pathways. However, most of the studies conducted on Ga12 and Ga13 have used the activated form of these proteins because many GPCRs that couple to this family can also activate Gaq family members. From these studies, numerous proteins have been observed to be downstream of Ga12 and Ga13 signaling. For example, c-Jun N-terminal kinase (JNK), the Na+/H+ exchanger (NHE), and phospholipase D (PLD) have been shown to be activated in the presence of these mutant proteins (58-62). In particular, overexpression of activated Ga12 leads to increased JNK activity through various small G proteins (Ras, Rac, Cdc42, and Rho) and the Src family tyrosine kinases, because dominant-negatives or specific inhibitors of these proteins inhibit JNK activation (58,59,63). In the case of the NHE, signaling via Ga12 or Ga13 shows distinct differences. For example, Ga13 can activate all three isoforms of NHE, whereas Ga12 activates NHE2 and NHE3 isoforms but will inhibit NHE1 (61). In the case of PLD, the activation of the rat PLD1 via Ga13 Q226L involves the Rho-dependent pathway because the dominant-negative N19RhoA and a Rho inhibitor can block this activation (62). These pathways and their biological functions are summarized in Fig. 4. Interestingly, the constitutively active Ga12 and Ga13 forms are oncogenic. Overexpression of these proteins leads to the transformation of cultured fibroblasts (64). The growth-promoting activity and oncogenicity of the activated forms is dependent on Rho signaling because their capability to form foci is inhibited when the Rho-sensitive Clostridium botulinum toxin C3 exoenzyme is present (65). The link between Ga12/13 and Rho signaling has occurred through RhoGEFs such as p115-RhoGEF, PDZ-RhoGEF, and leukemia-associated RhoGEF (LARG). Ga12/13 can physically interact with these RhoGEFs through their RGS domain and may stimulate their guanine nucleotide exchange activity toward Rho (66). Nevertheless, Ga12 and Ga13 display distinct signaling pathways toward Rho. Activated Ga13 can stimulate the GEF activity of p115-RhoGEF, whereas Ga12 cannot. The difference is also shown in Ga13 knockout mice. The Ga13-deficient mice show embryonic lethality resulting from defects in the vascular system, and Ga12 cannot rescue the function of Ga13 in these mice (67). Recent experiments have shown that Ga12 can stimulate the GEF activity of LARG only when this protein is phosphorylated by Tec, a nonreceptor tyrosine kinase (68). Therefore, Ga12 may be routed to Rho signaling via tyrosine kinases such as Tec. There are over five GP-isoforms, of which two are splice variants. They include Gp1, Gp2, Gp3, Gp3S, Gp4, Gp5, and Gp5L (69-71). The least similar of the Gp-subunits is Gp5. Gp5 is expressed mainly in the central nervous system, whereas Gp5L is expressed only in the retina (70). In contrast, there are more than 13 different Gy-subunits. The Gy-subunits can be modified by a number of processes, such as isoprenylation, methylation, farnesylation, and geranylgeranylation. Several good reviews have been published regarding the structure and function of the GPy complex (12,69-71). The GP- and Gy-subunits are considered to form one functional unit. They exist in several specific combinations and various techniques involving purified proteins, functional expression, yeast two-hybrid systems, and ribozyme approaches have been used to determine the various combinations (69,72-74). Some of the residues that determine the specificity of these interactions have been localized. For example, the specificity of the assembly of the GPjYj complex and GP2Yi complex appears to be determined by a stretch of 14 residues lying within the middle of the Gy-subunit (69). Additionally, the residues in GP that contact the region of Gy are clustered on blade 5 and a small section of the N-terminal region of GP (69). The GPy complex can affect downstream effectors just as well and as much as the Ga-subunit. In 1987, the first effector of the GPy complex, the G protein gated inwardly rectifying potassium channel (GIRK), was discovered (75). Since then, a number of downstream effectors of GPy have been identified. For example, adenylyl cyclase, phospholipases CP1 through CP3, and PI3K are directly affected by the GPy-subunit (12,69,71).